A while back, Melissa, a reader and frequent commenter on The Shy Lion, emailed these amazing wall hangings that her knitting group made. They were so neat that I had to share them, so this is a guest post of sorts. Check ’em out! 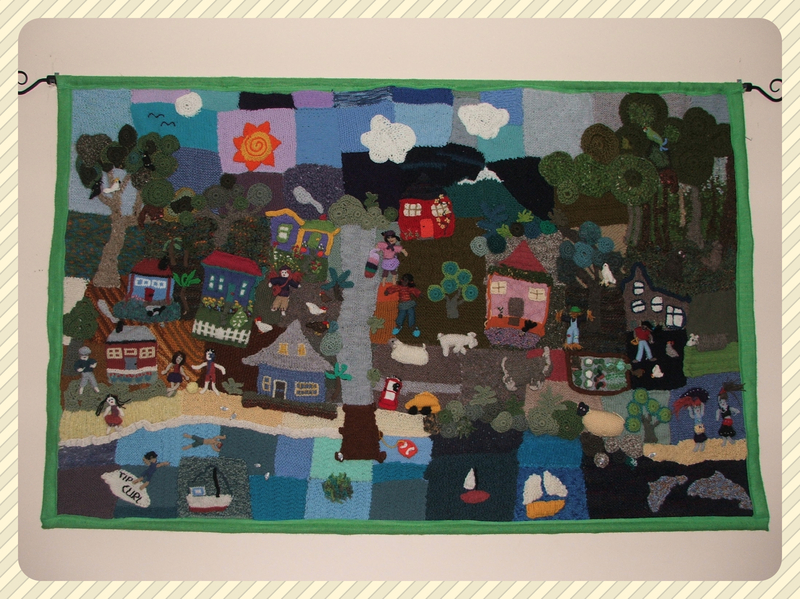 To give you a little background on our knitted wall-hanging, it was the first project of our newly fledged knitting group here in Far South Tasmania, and was intended to be loosely based on our little local township. There was supposed to be a plan (we intended to knit the panels a uniform size), however as it evolved, the project began to have a life of it’s own and the plan got thrown out the window…a happy little accident! An assortment of panel sizes were knitted along with houses, people, the foreshore, bird and animal life, plants, rocks, sky and gardens. 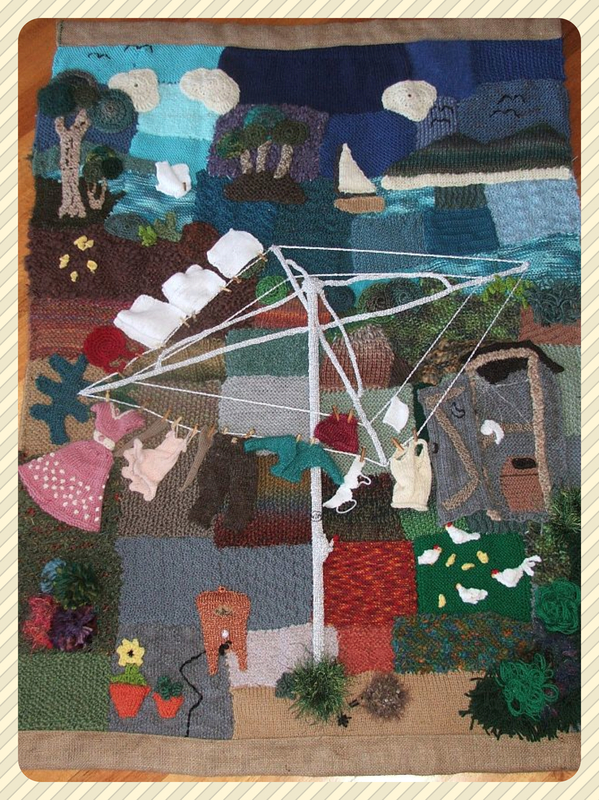 Lots of ideas, plenty of laughs and conversation grew into a pile of knitted objects which seemed, in the end, to pull itself together into a wall-hanging that captures life in our neck of the woods (with some poetic license!). Our finished hanging is 1.2 meters x 1.8 meters and is stitched onto a hessian backing with curtain rods at the top and bottom to support it. Those of us involved in the project were beginners (children and adults) as well as experienced knitters who shared their skills – about a dozen people in all. We were suitably proud of the result and entered our wall-hanging into the crafts section of the Huon Show and won ‘Highly Commended’…though it may have been a controversial exhibit as we still had threads hanging at the back of our project….those people who exhibit will gasp, but we didn’t have a clue about the level of perfection required, being total newbies. 🙂 Nevertheless, we had won an award and it was a happy day indeed! You’ve heard of six degrees of separation? Well there’s only three in Tasmania, and the word got out to a couple of people who were putting together an exhibition called The Knitting Room. We were asked if we’d like to contribute a wall hanging for the exhibition. The answer was a swift Yes!! The timing? Deadline in SIX WEEKS!! This time there was a plan. A rough drawing of the layout that was based on a postcard of our bay and then tweaked to fit the 50’s theme of the exhibition. We wanted a hills hoist in the foreground with 50’s clothes hanging from it. I don’t think I can do justice to the learning curve that we took on – but when you dive right in and wing it, then somehow a project can fall together – perhaps being furiously busy leaves no room for doubt! We used old magazines and photos as a guide for the clothes – for instance, the green cardigan was based on a picture on the front of a 1957 copy of ‘My Home’. Another contributor remembered a skill she learned at school in Switzerland to twist silver yarn, making an authentic looking clothesline and she also knitted up the most gorgeous 50’s style dress. One of the group wanted to knit stockings and she did it with the finest needles we had and some very fine yarn and her husband made the tiniest clothes pegs from bamboo. We wanted to capture a moment in time, with a strong sea breeze blowing the clothes dry, the door of the outside ‘dunny’ blown open, chickens pecking about and other little incidents that you notice the longer you look. So here we have Southport Washing Day 1950 (looking out of the kitchen window) ready to go to the Knitting Room as part of the exhibition. The curators of the exhibition were really happy with our wall hanging and The Knitting Room exhibition was amazing It was like a knitted neighbourhood with interior rooms and outdoor gardens where the detail in the work was mind-blowing, a knitters nirvana, check out the link and the movie here. She sent me this ages ago, but my inbox is a complete disaster and I thought I’d lost it, but I’m so glad I found it (stashed in a folder marked “Blog” funnily enough). Thanks so much, Melissa! Whoa, that is amazing! I can’t even imagine how much work went into that o_o I especially love the sparkly hills hoist! I dig it a lot! I squealed when I opened the email. No shame.